Child-Centered Play Therapy Research: The Evidence Base for Effective Practice offers mental health professionals, school district administrators, community agency administrators, judges, lawyers, child protection caseworkers, and medical professionals a comprehensive discussion of play therapy research studies. Guidance is provided on evidence-based methods, as well as on how¿future play therapy research should be conducted. 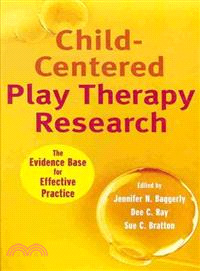 With coverage of important practice guidelines, Child-Centered Play Therapy Research identifies the most prominent and current play therapy research studies, as well as research directions for clinicians to design evidence-based research studies of their own. Jennifer N. Baggerly, PhD, LMHC-S, RPT-S, is an Associate Professor in the Counselor Education Program at the University of South Florida. She is a Licensed Mental Health Counselor Supervisor and a Registered Play Therapist Supervisor. She serves on the Association for Play Therapy (APT) Board of Directors and is former research chair of APT. Dee C. Ray, PhD, LPC, RPT-S, is Associate Professor of Counseling and Higher Education and Director of the Child and Family Resource Clinic at the University of North Texas in Denton. She is a Licensed Professional Counselor Supervisor, National Certified Counselor, and Registered Play Therapist Supervisor. Sue C. Bratton, PhD, LPC, RPT-S, is the Director of the Center for Play Therapy, Associate Professor of Counselor Education, and the former clinical director of the Counseling Department at the University of North Texas in Denton. She is a past president of the Association for Play Therapy and has served on the APT Board of Directors for six years.